You might not pay attention to the web browser you’re using if all you use it for is to casually surf the web. But when getting down to business, you need your browser to get you where you’re going as quickly and easily as possible. As a Windows customer, you’ve likely surfed the web with Microsoft Edge, the browser built into Windows 10. Microsoft Edge is great for regular browsing, but more importantly, it’s designed for productivity. It’s fast, secure, and designed to optimize battery life. 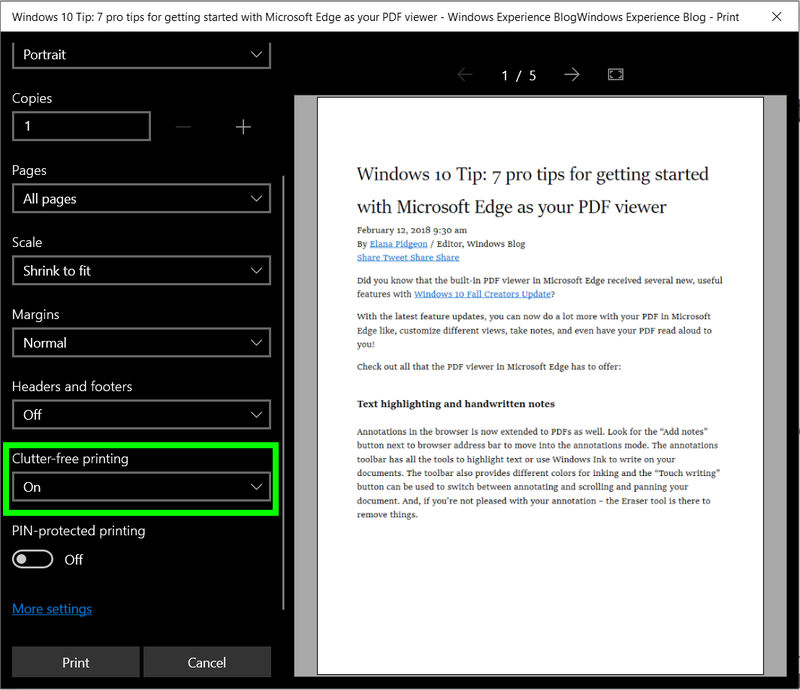 Microsoft Edge also includes unique features and capabilities that can help you get even more productivity—and enjoyment—out of using the web. Here are five ways Microsoft Edge can help. It can be hard to quickly find the page you want when your browser tabs are open to many different websites. In Microsoft Edge, you can see a visual preview of all the pages or tabs you have open. Select the Show tab previews arrow at the top of the browser window, to the right of your open tabs. The screen will drop down to display thumbnails of all your open pages. Select any thumbnail to open it as a full page. If you have lots of pages open, you might need to use the Scroll tab list arrows to the right and left of the previews to find the page you want. Select the arrow at the top again to close the previews. Already have a lot of tabs open but need to open a few more? Microsoft Edge lets you set them aside until they’re needed. At the upper left-hand side of the Microsoft Edge window select Set these tabs aside icon. To see the tabs you’ve set aside, select the See all your tabs button at the top left corner. Select any one of your tabs to open it. And again, arrows on either side of your set aside tabs allow you to scroll through to see any tabs that are out of view. Clicking on any tab you’ve set aside there will automatically bring the Restore tab option into view. Select it to bring your tab back into view. Remove individual tabs by clicking on the X in the thumbnail. Remove all tabs you’ve set aside by clicking the X in the upper right-hand corner. Want easy access to your frequently used pages? Pin them to your taskbar to open them with one click. 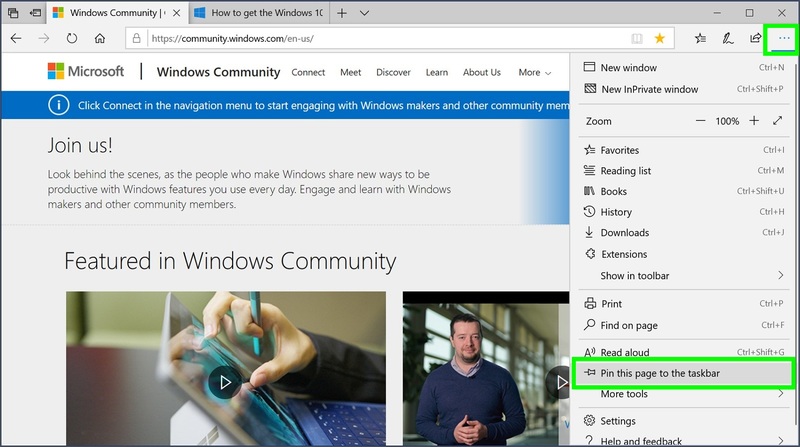 To do this, select Settings at the top right of Microsoft Edge (it will look like three dots) and then select Pin this page to the taskbar. Want to read the content of a web page without the clutter and noise of ads? Switch to reading view. Click anywhere on the page to change the font size, convert to full-screen, and even have Microsoft Edge read text aloud. While in reading view you can also print pages out without the ads, saving ink and paper. To do so, go to your browser and open the page you want to print. Click the three dots in the upper right-hand corner of your page, then scroll down to select Print. Your printer window will open. Scroll down and select Clutter-free printing. Not every page on every site has reading view—Microsoft Edge will let you know if a page can be switched to reading view by making the Reading view button visible in the address box. It happens all too often—you’re on the web when suddenly a video or ad begins to play, interrupting your focus. How do you locate it and turn it off quickly? Microsoft Edge helps you quickly find the page and mute it by showing a speaker button on the tab. Just select the speaker to mute the page. When you’re ready to listen, click the button again. Putting even just a few of these Microsoft Edge features into play could help your organization, focus, and productivity while using the web. Happy browsing!